65-year-old man with substernal chest pain. This gentleman had chest pain and associated symptoms suggestive of an acute coronary syndrome. 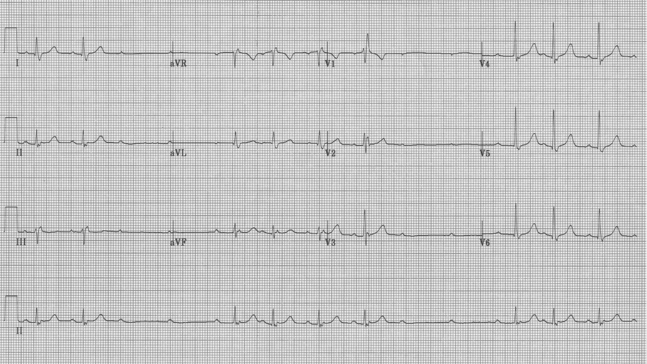 His EKG reveals STEMI in leads V2 – V5. This is an important pattern to recognize. A RBBB does not perturb the depolarization very much (because the RBBB supplies the much smaller side of the heart), certainly much less than LBBB. Because the depolarization is less altered it is expected that ST-segment changes of acute ischemia or infarct will be recognizable on the EKG. 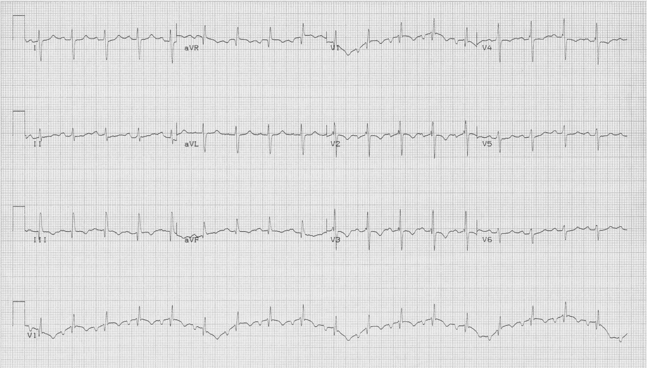 If there are any questions about the ST-segment elevation in V2-3 remember that the horizontal tracings on the 12-lead are simultaneously recorded, and that complexes line up vertically. The beginning and the end of the QRS is clear in V1, and if you follow the end of this QRS down through V2-3, the ST-segment in these complexes becomes clear – it is not just a wide QRS in these leads! A 45-year-old man with a worsening chronic respiratory disease. 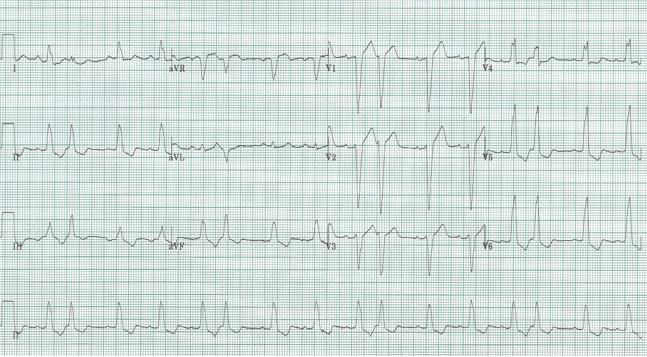 This EKG gives the diagnosis…and more! This EKG is a good example of how the differential of a tall R wave in lead V1 can be helpful (see “Tall R waves in V1” under website section EKG discussion). This EKG is from a patient with primary pulmonary hypertension and significant RVH. Notice the respiratory rate…since the V1 lead is on the chest, the rhythm strip records the chest excursion. The respiratory rate is approximately 24/minute! 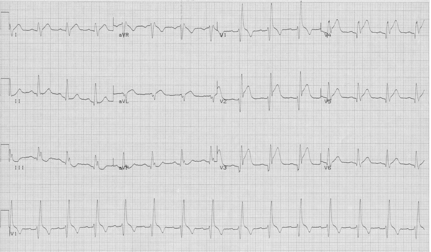 75-year-old man presents after syncopal episode. I love this EKG! The rhythm is basically 2° AV block, Type II…but with a twist! The P waves are regular with multiple dropped beats. The conducted beats have a constant PR interval, except for the first PR interval of each group that is actually a bit longer. Maybe this is a “reverse Wenckebach”?! No, actually, the initial slightly longer PR interval is likely non-conducting – the first QRS of each group is probably a junctional escape beat. Notice that the first QRS of both groups is the exact same distance from the preceding QRS, and at a rate consistent with an escape beat. Notice also that the purported escape beats are ever so slightly different in morphology compared to the normally conducted beats. What is the rhythm of this EKG? The underlying rhythm is sinus at a rate of 70/minute. The QRS morphology of the sinus rhythm complex is LBBB (QRS ≥ 120msec, tall monophasic R in V6). The 4th and 8th beats in the rhythm strip above have a similar morphology to the sinus beats but are premature. Notice that the T wave following the sinus beat and before the early beat is different – deformed by a premature ectopic P wave, suggesting that these early beats are PACs. As a confirmation, you can demonstrate that these early beats are not AV dissociated (eg, the sinus “metronome” is reset by the early ectopic P and subsequent P waves do not appear “on time”). PACs are not fully compensated. 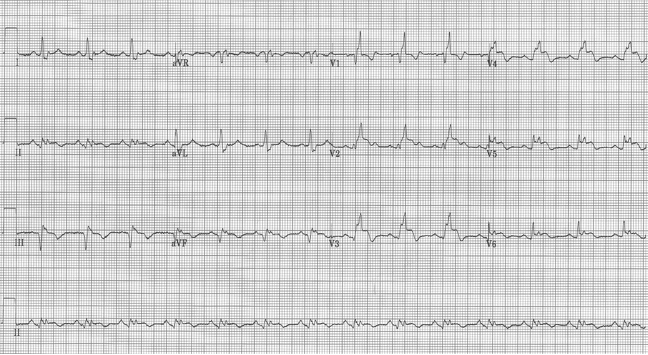 While this premature beat might look like a PAC, it is fully compensated (AV dissociated) and therefore a PVC!